Healthy Baked Sweet Potato Oatmeal: An easy baked oatmeal recipe that tastes just like a sweet potato casserole. I am sharing yet another fabulous Healthy Oatmeal Recipe with you today. Sweet potatoes and maple syrup are folded into hearty, healthy oats and baked to perfection for a creamy, easy, healthy breakast. Sweet potatoes and oats are both filled with fiber, nutrients, and can be featured in both sweet and savory recipes. Not to mention they are both budget-friendly food items that pack a lot of bang for your buck! And I am all about saving you money with easy frugal meals. My family ADORES Sweet Potato Casserole. We seriously could eat it all year long (and why should it be reserved for just the holidays!). 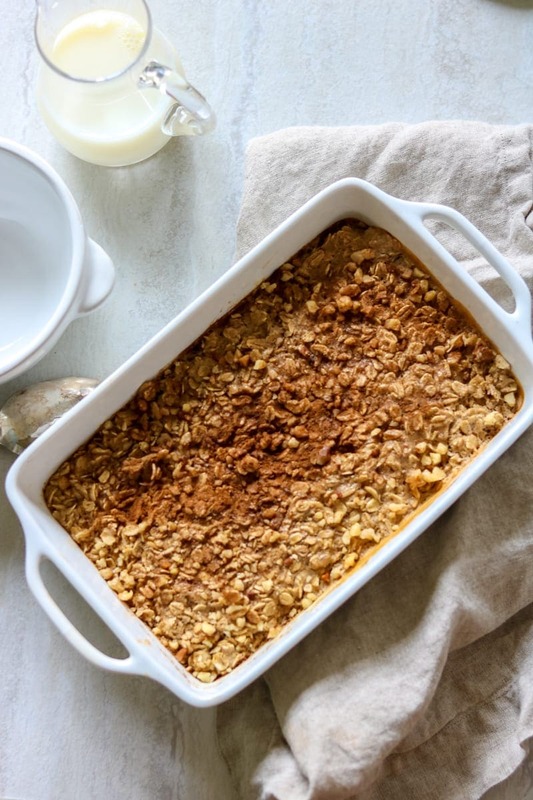 In an effort to give my family more opportunity to devour Sweet Potato Casserole, I decided that the base for my sweet potato casserole, would be the perfect base for a baked oatmeal recipe. Basically I just took the streusel topping from my Vegan Sweet Potato Casserole and mixed into baked sweet potato puree. And then I called this Sweet Potato Oatmeal breakfast! My family LOVED it and I am pretty certain your family will as well. Use any milk you like for this sweet potato oatmeal. I have used regular milk, coconut milk and almond milk with great success. I used old fashioned oats for this recipes, but quick cooking oats work as well. 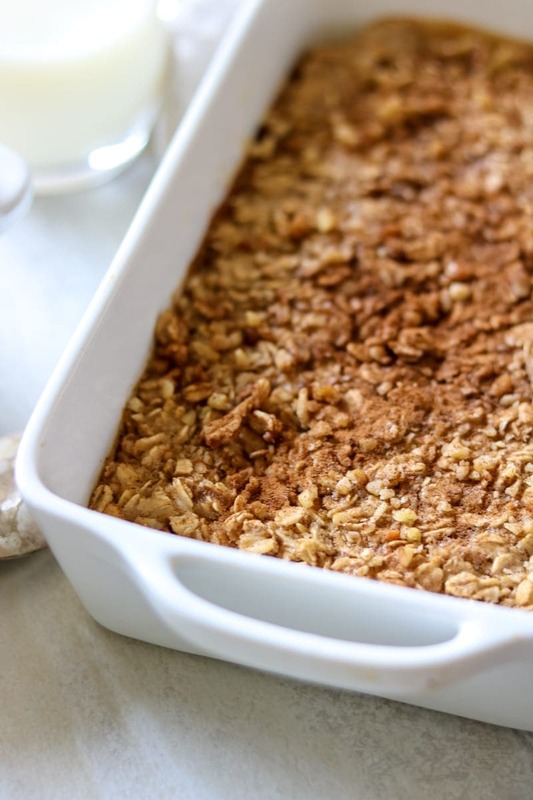 Be sure to use certified gluten-free oats to keep this Baked Oatmeal gluten-free. If you need to have a Vegan Oatmeal Recipe, omit the eggs and use non-dairy milk. The oatmeal will not be as much of a custard-like texture without the eggs, but it will will still be delicious. If you don’t have Sweet Potato Puree on hand, use canned Pumpkin and it will be a lot like Pumpkin Pie Oatmeal. I used only 1/3 cup of maple syrup, if you like your oatmeal really sweet, you can up that to a full 1/2 cup or even cut back on sugar in this easy oatmeal recipe, by cutting the maple syrup to 1/4 cup. You can use melted butter in place of the melted coconut oil. Feel free to add some heart-healthy chopped walnuts to this oatmeal as well. That is always a classic in sweet potato casserole. 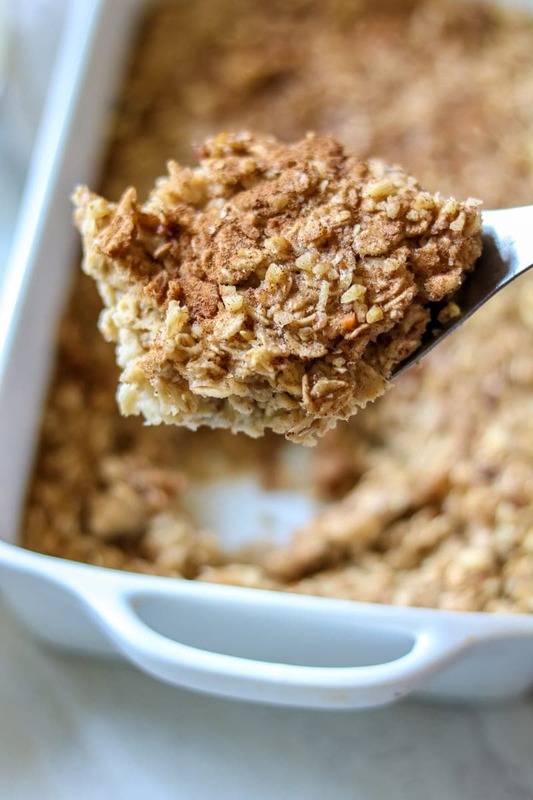 An easy, gluten-free and naturally-sweetened baked oatmeal recipe. Mix all ingredients together and spread in 2 quart pan or 8 inch square pan. Bake for 20-25 minutes, until oats are tender and moisture has been absorbed. If you don't have Sweet Potato Puree on hand, use canned Pumpkin and it will be a lot like Pumpkin Pie Oatmeal. Holy oatmeal batman! This is so totally perfect for Fall! I can’t wait to dive in! WAHOO!!! It is a great fall recipe! This yummy, healthy sweet potato oatmeal was just as tasty as it looks in your images. It was such a warm and satisfying breakfast – the perfect start to a busy day! YAY!!! That makes me so happy thanks for sharing Denay! How can I adjust the recipe for steel cut oats? I love this recipe. Made This & traditional breakfast casserole for Christmas thinking ‘I love sweet potatoes & it will keep me on track with my eating goals’ everyone loved this!!!! I make it all the time sometimes I use pumpkin and crushed pineapple.